The yokozuna duo of Harumafuji and Hakuho remained one win back of the leaders on Thursday, the fifth day of the Summer Grand Sumo Tournament. Hakuho, who is seeking his seventh consecutive title and 35th career Emperor’s Cup, improved to 4-1 when he salvaged victory from the jaws of defeat against Aminishiki. The yokozuna was able to shove the No. 2 maegashira about the ring by slapping at him but could not shove him out. As the slapping continued, Hakuho missed his mark with one shove, lost his balance and spun about with his back to his opponent. 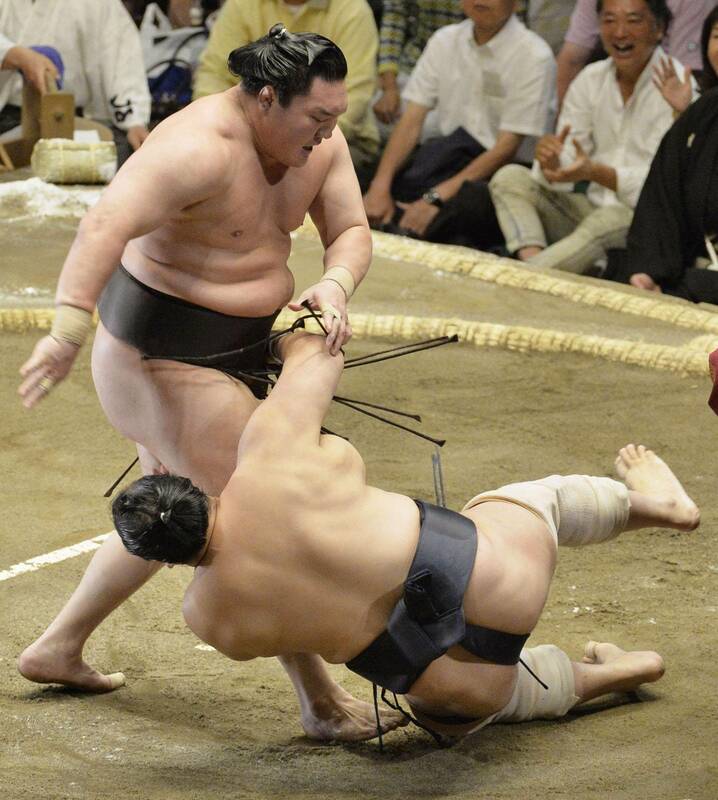 Aminishiki was perfectly poised to end the fight, but rushed his effort to throw the yokozuna and missed. Instead of victory, Aminishiki found himself sliding slowly to the surface with his arms wrapped around the legs of the bemused yokozuna, who could only smile at his good fortune. 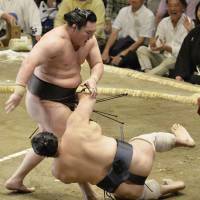 Hakuho improved to 36-4 in his career against Aminishiki, who fell to 1-4. Yokozuna Harumafuji (4-1) rebounded from his first loss of the tournament the day before by rushing Egyptian maegashira Osunaarashi (3-2) over the straw bales with a speedy and sure charge. In what has been an odd start to a tournament, the only unbeaten wrestlers are a pair of rank-and-filers, No. 8 maegashira Takayasu, who dispatched Ikioi (3-2), and Brazilian-born No. 11 Kaisei, who shoved out Chiyomaru (1-4). Ozeki Kisenosato was forced out to his second defeat in a heartbeat by sekiwake Myogiryu (2-3), who caught his opponent napping on the tachiai and carried him out with his charge. “My sumo is predicated on pushing forward and I was able to accomplish that today,” said Myogiryu. The last ozeki to fight, Kotoshogiku, pulled even with his colleagues at 3-2 with a tidy effort against huge komusubi Ichinojo (2-3). The ozeki took advantage of a quick first step out of the tachiai and his low center of gravity to force his less-prepared opponent from the ring. The victory evened their career records against each other at 2-2. Sekiwake Terunofuji (4-1) forced out top-ranked maegashira Tochinoshin (1-4) to remain among the top-ranked wrestlers with a single loss. Sokokurai (1-4) withdrew from his match against fellow maegashira Kitataiki (2-3) who won by default. Sokokurai suffered a fracture in the medial wall of his right eye socket and will require two weeks of rest to heal. Ozeki Goeido demonstrated his patience and balance en route to winning a tough match against top-ranked maegashira Takarafuji (2-3) by twisting him to the surface with an uwatenage overarm throw. Goeido improved to 3-2. In the first match of the day in the elite makuuchi division, Mongolian No. 14 maegashira Kyokutenho (3-2) handed No. 16 maegashira Amuru his first defeat, while establishing a record with his 1,445th career appearance in the top flight.